When we talk about 3d chalk drawings we usually talk about Julian Beever, Kurt Werner, Eduardo Relero or Edgar Müller. Well, just as I started to believe I exhausted all the available material on this topic – I heard about Gregor Wosik! Gregor is an academy-educated Polish lad who migrated to Germany back in 1984. Street-art, murals and oil paintings belong to his particular strengths. In Germany Wosik is primarily known as a street painter. This particular art form gives him the opportunity “to live out his passion”, and maintain direct contact with his audience. His works are characterized as high-quality and detailed. The motives of the images range from classical to current issues. There’s something odd in the picture thou… The left hand doesn’t appear in the how this chalk drawing came to existence section. It looks nice but unfortunately it is flawed. It might have to be posted under seemingly bent. Let me explain: if you cover the top of the bottle with your hand you will see that the bottle is facing towards you and you should (!!) be able to see the top of the bottle. If you cover the lower half of the bottle it seems to be pointing away from you as if it is lying on the ground (=seemingly bent). Probably an unintentional error but an error none the less. Personally I like the Johnny Walker one the best. 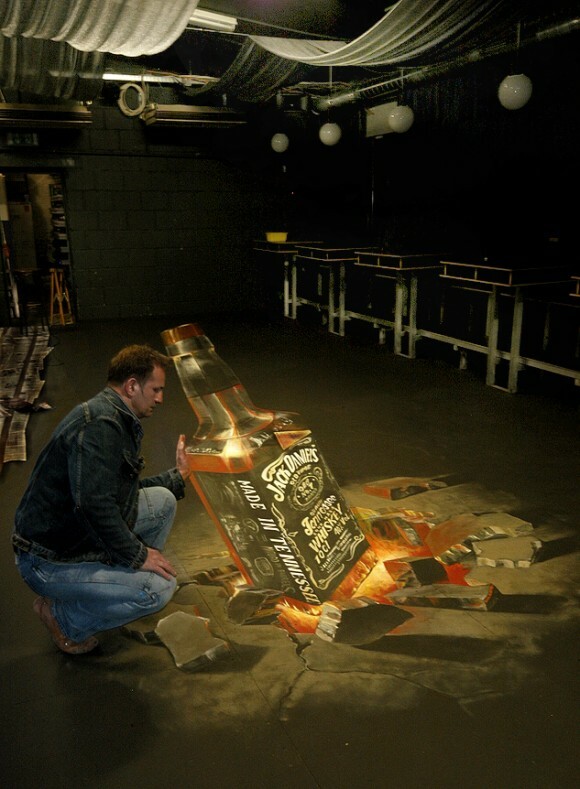 It’s got more detail and is leaving a better message than the simple bottle busting out of the floor. Check the perspective out on this!! Some people have entirely way too much time on their hands. Ahh Shnaps that is cool! What makes this picture what it is….that no one has mentioned yet, is that the guys hand is BEHIND the bottle. You can’t just stand next to the Eiffel Tower and do that. This chalk drawing included the hand into the picture, therefore making this illusion that much more realistic. It’s very clever. And the colors are spot on. haha i know hoe that works… down my road, i have got one and its a pic of homer simpson saying DOH lol :) but this is crazy!